We spent the evening with angels! Well, not really angels in the strict biblical sense, but certainly in the more popular sense. Just listen to them sing and laugh and pray; watch them glide across the floor, smile with joy, and demonstrate the love of Christ and tell me they don't sound and appear as angels. 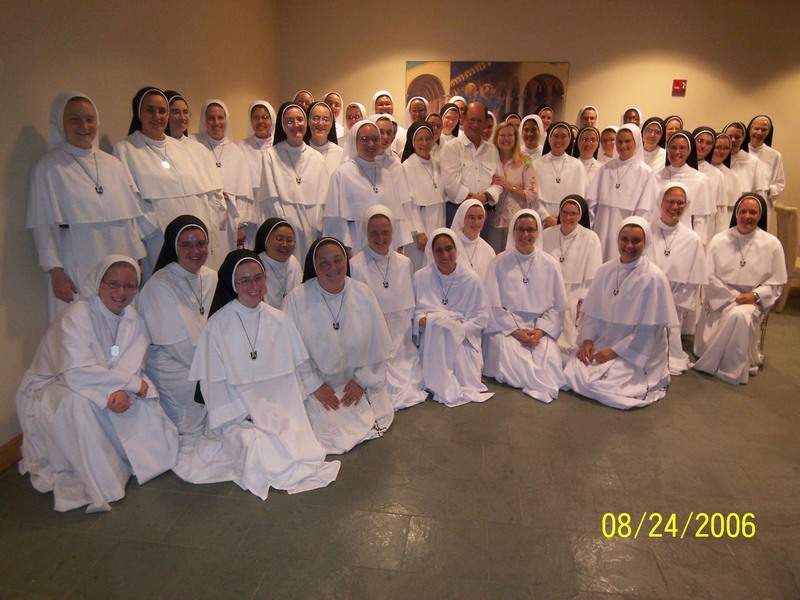 These are the Sisters of Mary, Mother of the Eucharist. Where's Steve and Janet? Click on the picture for a larger image. These are not average women. These are bright, educated (many professionals), intelligent, determined women with a mission. They are a very impressive and formidable group. Tonight Mother Assumpta Long invited Janet and I to show our new DVD "Apostolic Fathers, Handing on the Faith." It was a wonderful evening and as always it was a blessing to be with these wonderful and focused women. They laughed and applauded and seemed to genuinely love the movie. The DVDs will be for sale late in September but I have a rough draft dub of the edit copy which I was able to show them for a Mini-World Premier. They commented on how there was nothing else like it, how full of information and fun it was, and how the blessing of God is certainly on the project. And also — what happens when someone "swallows the Holy Spirit, feathers and all" as Martin Luther said. Stay tuned! I have been told by some that I am wasting my time arguing with the man, or that it is not good to get animated and argue. I beg to differ. I would NEVER waste my time with the man if it weren't for all the others that will read the correspondence and be helped by it. "Dear Steve: Thank you for your posted document about the Assumption. I am well into conversion discernment, and had my sister read your Part I as she is beginning this discernment process. She had never considered that Jesus didn't teach sola scriptura until she read this work of yours. "Just wanted you to remember that your work is not in vain. Thank you! Keep writing! I find your work most helpful as I discern and write about my journey." In the meantime, read my blog about "denominations" here based on a sign I saw for the "New Progressive Missionary Baptist Church" which is of course a new breakaway group from the OLD "Progressive Missionary Baptist Church." The School Year is here again.. Are you looking for good Catholic materials for teaching? Don't forget the offerings at Ignatius Press. They are trying to turn the tide — getting solid Catholic material back in schools, parishes, and homes. They have a load of great new materials. Check it out here (www.IPReligiousEd.com) on click on the image.